The impact of disease-causing free radicals on the human body may be reduced by wearing special high-tech textiles just a few hours a day, according to a recent international study. Results from this first time study conducted by Nanobionic, showed beneficial effects of these textiles treated with the technology, in reducing free radical levels in healthy individuals as well as in patients suffering from free-radical-related disorders. In addition, the trial suggested that these textiles may also act as anti-oxidants on the body. The results of the study were published in the Journal of Medicinal Chemistry and Toxicology. The patented technology is developed by Nanobionic, an international manufacturer of smart textiles, founded in 2011 by George and Ermis Psipsikas, based in New York and Athens, Greece. Nanobionic manufactures smart clothes using innovative textiles that harness and transform the body’s natural energy to enhance athletic performance and overall wellbeing. The trial – which was conducted in four medical centers in Greece, Sweden and Italy – recruited 24 volunteers to test the effects of daily use of Nanobionic’s clothes and their connection with the human body’s aging process. The study was conducted at the National Hellenic Research Foundation and the Orthoviotiki Medical Centre in Greece; Örebro University Medical School in Sweden and NEST CNR – Nanoscience Institute and Department of Physics, at the University of Pisa in Italy. The results showed that wearing Nanobionic clothing for two hours a day during six days, cut free radical levels in peripheral blood cells in two-thirds of healthy volunteers, ranging from 9.13% up to 95.38%. The researchers also examined the effects of Nanobionic clothing on Raynaud’s syndrome, a rare blood disease linked to oxidative stress and free radicals. The disease causes the blood vessels in the fingers and toes to narrow when the extremities are cold or the subject is feeling stressed. Raynaud’s syndrome is common among patients suffering with rheumatic disease and vascular conditions. There are trillions of free radicals produced daily within the human body, which are naturally dealt by our antioxidant system. But although the body’s mechanisms help prevent the harm from free radicals, this ability gets weaker as the body ages with time. When the production of free radicals exceeds the body’s protective ability to treat them through the antioxidant system, “oxidation stress” takes place, leading to the irreversible damage of the body’s cellular structure and affecting the cell’s function itself. As a result, free radicals are being held responsible for many of today’s health ailments, such as obesity, rheumatism, premature ageing, skin disease, Alzheimer’s disease, multiple sclerosis and cataract. Innovative textiles for improved wellbeing using a specialised bio-ceramic coating, Nanobionic products take the body’s natural thermal energy and recycle it into far infrared rays, the same rays contained in sunlight that are responsible for the photosynthesis process used by plants to produce energy. Because light stimulates the body’s basic biological functions, recent studies have shown that far infrared energy stimulates metabolism and has a beneficial effect on the body’s wellbeing. A preliminary report by Nanobionic has suggested that the use of these smart textiles has a positive effect on athletes’ performance. The material developed by Nanobionic have shown they can deliver up to a 99% return of far infrared energy to the body, resulting in benefits such as; better athletic performance (increased muscle strength and endurance while wearing the clothes) and also benefits the skin causing an improved appearance of cellulite in women. But the latest study shows that the benefits of these smart materials can go further and improve people’s health by fighting the harmful effects of free radicals. 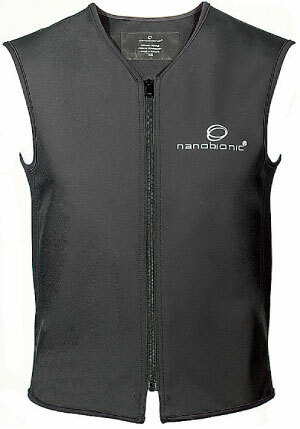 “Nanobionic will revolutionise the way people will be wearing clothes in the future. We have developed a breakthrough technology that improves people’s lives in many different ways” said Nanobionic founders George and Ermis Psipsikas. The company is the recipient of 12 international innovation awards. The company sells its products through retailers in Europe and online to more than 40 countries.